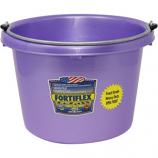 For over 45 years Fortex-Fortiflex has been the quality leader of heavy-duty, long-lasting pails, tubs and other industrial grade containers. 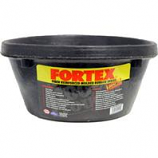 Our Fortex line is the Original Reinforced Rubber pails and tubs you've seen for over 45 years on the farm and in construction sites. • 00% Reinforced Rubber Composition Makes These Products Extremely Resistant To Cold (Sub Zero) Weather Cracking. • Rubber Over The Fence Feeder. • Uses: Multiple Feeding Of Animals, Salt and Mineral Feeders, Ceramic Tile Soaking and Other Farming and Industrial Chores. • Can Be Used In Any Agriculture Or Farm Setting For The Feeding Of A Variety Of Different Animals. Ideal for small animals. Crack and crush resistant. Flexible to low temperatures. Immediately bounces back to shape. . Perfect for space saver for farm and home use. Features a low wide shape with an extra wide top making it ideal for calf feeding. Heavy galvanized fittings made with fortalloy rubber polymer alloy to resists cold weather cracking. 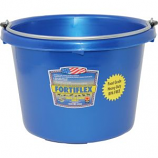 Made in the usa. .
• Round 30-Quart Feeder Tub Made With Fortalloy Rubber-Polyethylene Blend For Exceptional Strength and Toughness Even At Low Temperature. 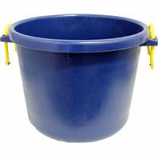 Excellent all around bucket with heavy wall construction making it ideal for both stable and household use. Double handle design with handles molded to sides plus heavy-duty ropes. Made in the usa. . .
• Feed Saver Ring Compatible. • Thick Wall Construction and Heavy-Duty Galvanized Fittings Ensure Long Lasting Durability. • Handy Bottom Handgrip For Easier Pouring Of Contents. • The Fortex Rubber Fence Feeder Can Be Used In Any Agriculture Or Farm Setting For The Feeding Of A Variety Of Different Animals. • Heavy Galvanized Fittings, Made With Fortalloy Rubber Polymer Alloy To Resists Cold Weather Cracking. • Heavy-Duty Design and Construction. 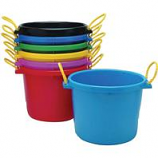 • Utility Pail 8 Quart Mango Green. • Flanges On Both Top and Bottom Of Feeder Make For A Sturdy Installation. • Twenty (20) Quart Capacity With Decorative Medallion and Etched Horsehead. • Heavy Duty Polypropylene Rope Handle. Fortalloy Construction. • Large 16 Qt. Capacity. • Ergonic Hand Opening, Reinforced Front Lip. • Heavy Duty Rear Prongs. • No Hardware Drop-N-Use Design. • Uses: Watering, Feeding, Maintenance and General-Purpose Use Around Farm, Home Or Industry. • For Watering, Feeding, Maintenance and General Purpose Use Around Farm, Home and Industry. • Flat Back Bucket 8 Quart Sky Blue.